You are at:Home»Constitutional Convention»What’s at stake if New York holds a constitutional convention? On Nov. 7, New York voters will decide whether to approve a constitutional convention. CSEA is working with New Yorkers Against Corruption to educate voters on why a convention is a bad idea. OUR PENSIONS: The state constitution states that our pension benefits “can’t be diminished.” If a convention is held, our pension protections could go away. ORGANIZING UNIONS: Our right to form unions could be at risk. COLLECTIVE BARGAINING: The state constitution also protects our collective bargaining rights. Right-to-Work has gained power in many states largely because they lacked the constitutional protections that New York has. WORKER PROTECTIONS: The state constitution also protects minimum wage rates, as well as the 40-hour workweek/eight-hour workday. WORKERS’ COMPENSATION: Should you need workers’ compensation, the state constitution helps protect your rights. 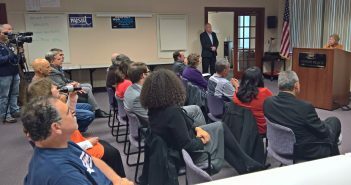 CIVIL SERVICE PROTECTIONS: Our state civil service system is guided by ‘merit and fitness,’ protecting against political patronage. These protections are jeopardized under a convention. PUBLIC EDUCATION: The constitution protects our children’s right to a free, public education, elements of which could be lost. ENVIRONMENTAL PROTECTION: “Forever Wild” protections for the Adirondacks and Catskills could be lost to corporate development. SOCIAL SAFETY NET: Many of New York’s most vulnerable people rely on public health care, welfare and unemployment benefits and other vital services, all of which are ensured under the state constitution. AGE DISCRIMINATION: The state constitution protects workers from being discriminated against by employers based on age. VOTING RIGHTS: The state constitution protects many of our voting rights, including our right to an absentee ballot. 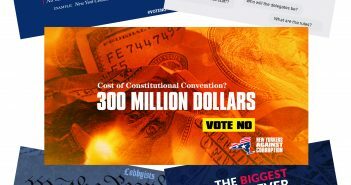 How do I get a Lawn Sign “Vote No to Constitutional Convention” ? I’m voting NO I WORKED HARD ALL THOSE YEARS! Everyone works hard. If I have no hope of getting in a union position, what the the Convention mean to me?